The Twins announced on Sunday that they had reached an agreement with Joe Mauer on an eight-year extension for $184 million, which Joe Christensen is reporting will be paid at $23 million per year. We'll get more details at 6:00 on Monday when a press conference is scheduled, but let’s tackle some questions that are popping up from Twins fans. Well, that’s more of an exclamation than a question, but I totally concur. Woo-hoo indeed. One of the things that baseball analysts struggle with is what a truly elite player is worth. Can you make up for their value with other, cheaper combinations of players and still be a championship-caliber team? I don’t know the answer, and I don’t care. Here’s what I care about: watching an elite player, maybe even historically elite, for the next nine years. Again, woo-hoo! Why nine years? I thought it was an eight-year contract? It’s an eight-year contract extension, not an eight-year contract. Mauer had a contract through this year and the contract extension was announced to go through the 2018 season, at which point Mauer will be 35 years old. So we have him locked up for nine years? Maybe, maybe not. We’ll hopefully find out tomorrow if there is an opt-out clause for Mauer at some point during the contract. That’s happened in some recent contracts, like last year’s deal for C.C. Sabathia. Sabathia can opt out of his seven-year deal with the Yankees next year, when it’s only three years old. This kind of a clause is usually justified as protection for the player if salaries skyrocket. 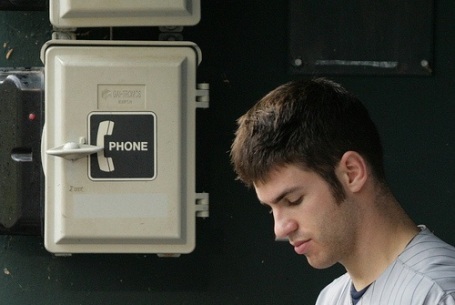 If Mauer and his agent think they already gave a hometown discount, they might regard that as important protection. Plus, with Mauer only being 26 years old, an opt-out clause after four years might allow him to be on the market when he’s 30, which is young enough to justify another longer deal. Like I said, hopefully this will be answered in tomorrow’s press conference. Did Mauer give a hometown discount? Would a bidding war between the Yankees, Red Sox or Mets have driven up the number higher than that? Maybe. Of course, Mauer would have had to wait another year, staying healthy and putting up huge numbers again to find out. Instead, he’s guaranteed the money either way now. What if he gets hurt or can’t stay at catcher? The money is guaranteed, so he’ll get it one way or the other. The Twins could take out insurance on it to help protect themselves, but that insurance costs money too, so it likely won’t be for the full amount. And if Mauer can play at a position other than catcher, the insurance wouldn’t help. A lot of the money Mauer is attached to him playing catcher. This offseason, the next biggest contract was signed by Matt Holliday, who returned to the St. Louis Cardinals. He signed a (much criticized) seven-year, $120 million deal, which averages out to about $17 million per year. Holliday puts up about 25-30 homer runs per year and has a career batting average of .318. Mauer showed similar power last year and has a career batting average of .327. Holliday isn’t quite the hitter that Mauer is, but he’s close. However, as a left-fielder, Holliday is making about $6 million less per year. So if Mauer needs to move out from behind the dish, but he still continues to hit, the Twins will be stuck paying about $4-5 million too much for him every year. That’s not terrible, provided he’s still producing offensively. Does this mean the Twins won’t have any money to spend on other players this year? Again, Mauer had a contract through this year for $12.5 million and it sounds like that stays intact, so this deal probably doesn’t affect this year’s money much. If there was a signing bonus, then it would affect this year’s money. However, the last deal Mauer signed did not have a signing bonus, and it’s pretty unlikely he needs the money right away. This could be significant, because the Twins also announced yesterday that Joe Nathan will undergo Tommy John surgery as soon as he can. It was reported last week that over half of Nathan’s salary this year could be insured, meaning the Twins might have $6 million to spend that they didn’t think they would have. That could come in handy when looking for a closer or at the trade deadline. Is any of the $184 million deferred, like Sid Hartman suggested? We don’t know. Initial indications are that it’s not. I’ll say this – if Mauer wants to make sure he’s paid market rate AND make the Twins as competitive as he can over the next eight years, it would makes sense for him to demand that a big chunk of that money be deferred. If you’ll indulge me in some over-the-top speculation, what if Mauer asked that $10 million of each year’s salary be deferred? The Twins would have $10 million more to spend on their team those years. Mauer gets his money, but he also benefits from playing on a team with an artificially higher payroll. Of course, the fiscally conservative Twins might not be crazy about penalizing the 2020 team to subsidize the 2012 team. And they could be really worried that other stars like Justin Morneau would see this as a viable alternative for their own future negotiations. Again, I hope we’ll find out more about this on Monday. Is $23 million per year too much? Will it cripple the Twins? The one question I never heard anyone answer throughout this contract negotiation was “How much is too much?” I’d like to be critical of that, but I don’t have an answer either. So let’s see what this is going to do to payroll for the Twins the next couple of years, assuming that the breakdown is $23 million per year as Joe Christensen reported. So on the right are some back-of-the-napkin figures for 2011…. I’d like to show you 2012, but things get really fuzzy by then. Jason Kubel, Michael Cuddyer and JJ Hardy could all be free agents. Francisco Liriano and Delmon Young could either be very expensive or gone. Nathan’s salary comes off the books. I compute a payroll of just $58 million or so, but we also have a tremendous number of open positions. The bottom line is that it’s just too far away to do any realistic analysis on it. What’s clear is that the Twins will need to rely on their farm system to provide help to cover contracts like this. Fortunately, that’s not just an economic reality; it’s a philosophical tenet of the organization. It’s what the organization has believed and done for the last ten years. So no, I don’t think it cripples the Twins. But it does likely mean that spending on free agents in the next decade could look an awful lot like it did last decade. This was a great offseason for the Twins and their fans. I hope you are enjoying it, because we likely won’t see another like it for another nine years. "But it does likely mean that spending on free agents in the next decade could look an awful lot like it did last decade. This was a great offseason for the Twins and their fans. I hope you are enjoying it, because we likely won’t see another like it for another nine years." This offseason the Twins signed Hudson, Thome and Condrey as free agents for a total of $7 million. That is not really much more, if any, than they have spent in the past on free agents. And I see nothing that will prevent them from spending that much again in the future. The bigger question is whether they can hang onto young players like Young and Liriano if they blossom into stars. But that's the reason I don't think it was ever likely the Twins were going to be big players in the free agent market. Holding onto the players they develop is a much more effective way to use the extra payroll space from the new stadium. Just to add some perspective. By my reckoning the Twins spent about $14 million dollars on free agents Hernandez, Lamb and Monroe before the 2008 season. That includes Lamb's 2 year deal. But the salary taken on just for 2008 was over $11 million. If Hudson, Condrey and Thome get released mid-season like those three, no one will be talking about how great on off-season this was for free agent signings. I mostly agree with your point, but I object to putting this year's free agents up against the junk they've signed the past few years. There's a world of difference between Hudson and Ponson, or Thome and Monroe. (Condrey, not so much difference...) The chances that Monroe was going to play for us were founded on Torii Hunter's hopes for his friend, not a scout's view of his game. I though Lamb might work out well for us, but no one believed Livan was going to be anything other than what he was. This year they spent the money on players, for the most part, rather than lottery tickets. "I object to putting this year's free agents up against the junk they've signed the past few years." You don't think Hudson and Thome are over the hill? I don't really either. But there is a reason both of them were available cheap. My point is that there was nothing unusual about the amount of money the Twins spent on free agents this off-season. Regardless of the outcomes, this was business as usual. None of the signings compare to Kenny Rogers who was not cheap. I concur with point #1.